Preheat oven to 375˚F. Line a muffin pan with 12 paper liners; set aside. In medium bowl, blend sugar and butter, then add in egg, and vanilla, blending well. Mix in the strawberries and bananas. In large bowl, whisk together flour, baking soda, baking powder, salt, and cinnamon. Add strawberry/banana mixture to the flour mixture and stir until just combined. Fill muffin cups 3/4 full and sprinkle tops with coarse sugar, if desired. Bake at 375˚F for 15-16 minutes or until toothpick inserted in center comes out clean. Let muffins cool in pan 5 minutes, the remove and cool completely on wire rack or serve warm. These muffins are great for breakfast, brunch, or an afternoon snack–they’d go great with some Strawberry Lemonade, too! 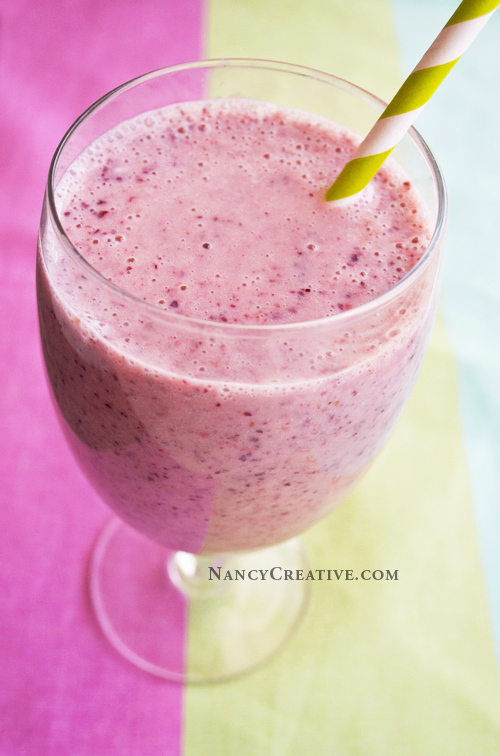 Do you have a favorite strawberry/banana recipe? This entry was posted in Breakfast/Brunch, Food and Recipes, Seasonal, Summer/Summer Holidays and tagged baking, bananas, breakfast, featured, fresh strawberries, muffin, strawberries, strawberry banana muffins on August 15, 2014 by nancyc. This is an easy, fruity drink to make–perfect for enjoying on a sunny spring day! This cooler has strawberries that you mash, or muddle, to release the juices, and then you add in the orange juice for a really great fruity combination! If you need to make a larger amount of servings, just multiply the ingredients by the number of servings you need–you could even mix up a large batch in a pitcher! When I was mashing up my strawberries, I found it was easier to do that in a medium-size bowl, and I used a spoon to mash them. But you could also mash them right in the glass if that works best for you. Divide strawberries between 2 (10 or 12-ounce) glasses. Add 2 mint leaves to each glass. Muddle (or mash) strawberries until they are crushed and juicy (you can use a spoon or muddler to do this). Add 4 or 5 ice cubes to each glass, then fill each glass with 1 cup of orange juice. Garnish with mint sprigs, if desired. If you want a slightly fizzy drink, use 1 cup juice mixed with 1 cup sparkling water. It will be less sweet, but the fizziness is nice! 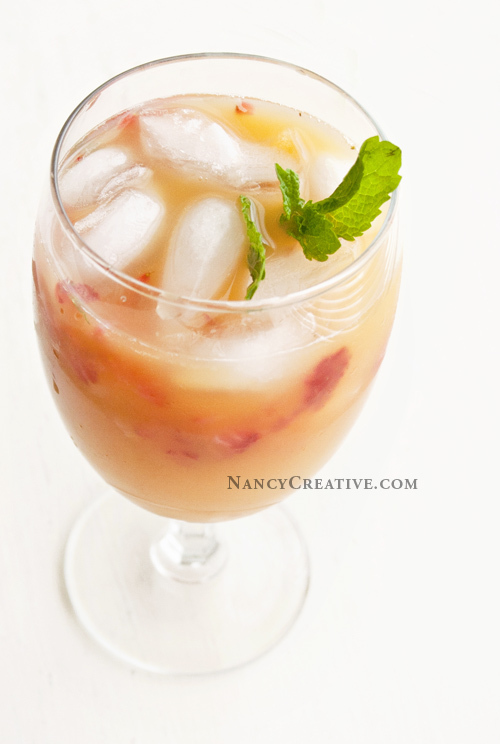 This would be a great beverage to serve at a spring breakfast or brunch. Maybe even on Easter! What types of fruity beverages do you like to make? This entry was posted in Beverages/Smoothies, Food and Recipes, Fruit, Healthy Eating and tagged fresh mint, mulled strawberries, Orange juice, strawberries on April 5, 2014 by nancyc.